The Hot New Ice Cream Shop Franchise Trend? Better Than an Ice Cream Shop Franchise? We've all heard the slogan "have it your way," and adventurous food options fit squarely with what urban foodies want. If you're in the pursuit of happiness and have got franchise fever, here's a tip for you on one very different ice cream franchise that might be your ticket to a sweet future. Sales of ice cream and frozen desserts are looking health, up 2.1 percent to $5.4 billion in the 12 months ending August 10, 2014. Here's one company that caught my attention, homegrown (and growing) in the Bay Area. There are well-known benefits to owning a franchise, and if you've noticed chain franchises all over, well, you've seen in the real world that food remains among the fastest growing category of franchise business. The most successful foodservice franchises and chain businesses have one thing in common: a great and consistent customer experience. Sure being predictable can sometimes be a negative. But that's how Starbucks and Chipotle and every other franchise attracts customers as they span the globe. Customers know what to expect. They like it. When you know what you want, choosing that chain is a no-brainer. Ice cream sandwiches hold a special yet tiny place in history. In 1928, the IT'S-IT ice cream sandwich shop opened in San Francisco. 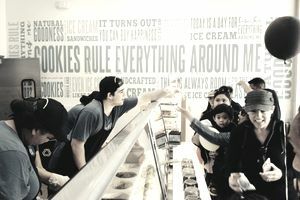 And while the shop is long gone, the company's packaged ice cream sandwiches boast a healthy cult following nationwide. For the most part, though, ice cream sandwiches have yet to hit cupcake/doughnut trend status. Imagine the appeal of high-quality ice cream in classic and exotic flavor combos, sandwiched in your choice of freshly baked cookies and priced at an affordable $3 or so. Bubbly staff are happy to roll your made-to-order ice cream sandwiches in sprinkles or other mix-ins to top off your amazing ice cream experience. That's what San Francisco Bay Area-based CREAM is all about. The fun, fulfilling CREAM customer experience also explains the name, which stands for Cookies Rule Everything Around Me. At CREAM, loud music blasts. Happy staff calls out orders, maybe dancing in between, or maybe as they scoop, smash and roll an ice CREAM sandwich together. The stores combine vintage and modern branding. It is all by design, CREAM founder Jimmy Shamieh says. "From the beginning CREAM chose to serve only premium quality products. It's also by design that we insist that our prices be affordable to families. We want to provide an unparalleled experience for our guests. In short, it makes us happy to bring happiness and smiles to our guests. If people share this view, they could make great CREAM franchisees." First and foremost come CREAM's family values. They are not a pure-play franchise operation. A franchisee must want to be part of a "family." They need to imbue the spirit of CREAM in an authentic way. At the opening, I met a couple of CREAM franchisees who started out as big fans of the company. Living in the Sacramento area, where weather can get blistering hot, they knew the market was ripe for an ice cream business offering quality and value. Their family had experience in owning franchises (both food and hotels) and were on the lookout for a good thing. They now own several CREAM franchises. When they spot a hot retail vacancy, they're quick to contact the CREAM team about opening another location. The company does not have pre-determined growth goals. In that way, CREAM is destined to succeed, with demand driving expansion, and a few locations will stay in the family. This approach illustrates the benefits of buying into a newer franchise system. CREAM is very straightforward about what they are looking for in a franchise. You'll see a focus on experience, funding, and passion, which as you probably know are keys to success in every business. Along with supporting franchisees, they want to be certain, especially in their early years, that everyone involved is ready for growth.